Caption - And now for something different seen by very few steam enthusiasts. 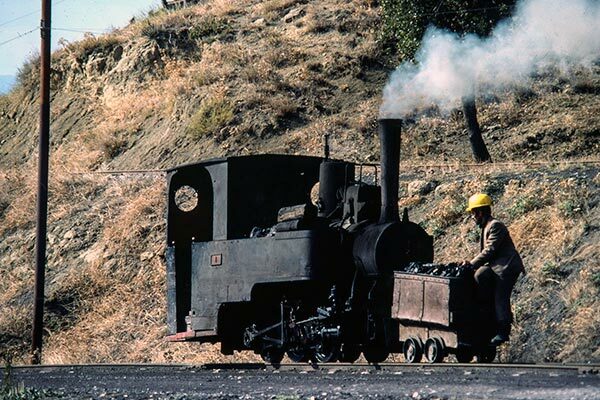 This 0-6-0T worked at 'Amasya Ozel Idaresi' in northern Turkey and was their no.1 (Henschel 4153 of 1895). A very short 60cm system serving a drift colliery there was unlikely ever to be the need for no.2 but it did exist though not seen on this visit. The colliery was close to the town of Suluova, which lies to the south of Samsun on the Black Sea. It seems this loco is a "Illing" which is one half of a "twin" back to back 0-6-0wt+0-6-0WT "Zwilling".